(Colorado Springs, Colo.) – Rio Olympian Eli Dershwitz (Sherborn, Mass.) 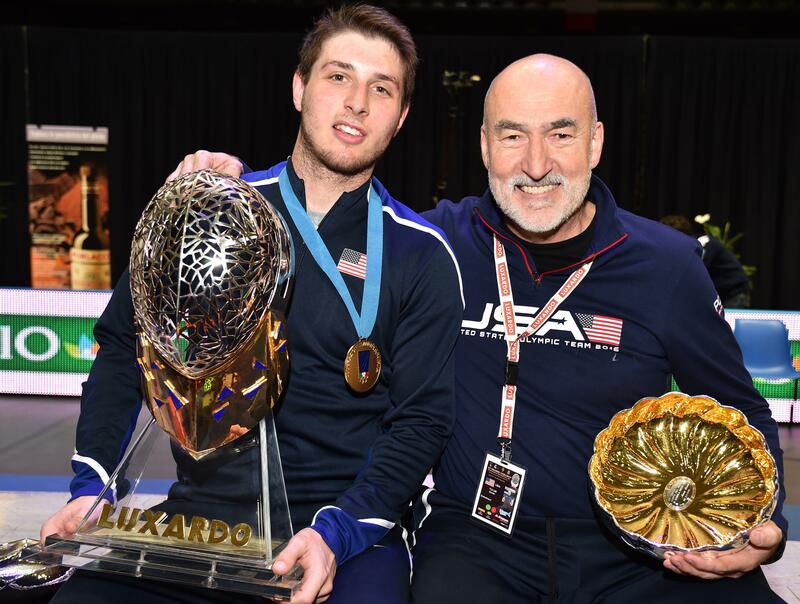 won his second World Cup title this season on Saturday as he became the first American ever to win the Padua Men’s Saber World Cup title in Italy. The gold marks the second World Cup title in the season’s first four tournaments for the Harvard junior who is now ranked No. 6 in the world and No. 1 in the nation after a 6-0 finish that included victories over both the World No. 1 and the two-time reigning Olympic Champion. Dershwitz narrowly escaped his opening round with a 15-14 win over Maxime Pianfetti (FRA) before becoming the only U.S. fencer to advance to the table of 16 when he defeated Stefano Sbragia (ITA), 15-10. In the next round, Dershwitz bested 2012 Olympic team medalist Luigi Samele (ITA), 15-12. Dershwitz drew World No. 1 Bongil Gu (KOR) for the second straight tournament after falling to the 2017 Senior World silver medalist in the quarter-finals of the Cancun Grand Prix last month. This time, however, Dershwitz dominated the bout, defeating Gu, 15-4, to bring their total head-to-head record to 2-2. With his third medal on the circuit during the last year secured, Dershwitz met two-time Senior World Team medalist Luca Curatoli (ITA) in the semis. With the score tied at four, Curatoli went on a 4-1 run to end the first period with an 8-5 lead. Dershwitz scored quickly in the second to tie the bout at eight before going on to take a 14-11 lead. Curatoli scored twice more before Dershwitz closed with a 15-13 win. Dershwitz came up against two-time reigning Olympic Champion Aron Szilagyi (HUN) in the final, fencing the Hungarian for the second time in his career and aiming for a second victory after winning their last bout at the Madrid World Cup before going on to take the silver medal. Dershwitz controlled the opening period, 8-3, and led by as many as seven touches in the second period before Szilagyi came back to cut his lead to 14-12. Dershwitz remained calm, however, and scored the winning touch to take the victory, 15-12. Rio Olympic silver medalist Daryl Homer (Bronx, N.Y.) advanced to the table of 32, taking a 15-10 win over Massimiliano Murolo (ITA) in the 64 before falling to Andriy Yagodka (UKR), 15-12. Former Junior World Team members Ben Natanzon (Manalapan, N.J.) and Andrew Mackiewicz (Westwood, Mass.) both advanced to the table of 64 after winning bouts in the preliminary table of Friday. Natanzon went 4-2 in pools and took a pair of 15-14 wins over Nurzhan Karim (KAZ) and Jules-Emile De Visscher (BEL) to make the second day where he lost to 2015 Senior World bronze medalist Max Hartung (GER), 15-7. Mackiewicz finished the pool with a 3-3 record and defeated Marios Giakoumatos (GRE), 15-3, and Fabrizio Marino (ITA), 15-11, in the preliminary tables. Mackiewicz lost his table of 64 bout on Saturday to 2017 Senior World bronze medalist Vincent Anstett (FRA), 15-11. On Sunday, Dershwitz, Homer, Mackiewicz and 2017 Senior World Team member Geoff Loss (Laguna Beach, Calif.) competed in the team event. The Americans won seven of nine bouts in the table of 16 against Japan to qualify for the quarters with a 45-34 victory. Team USA took four of the six bouts in the quarter-finals against Russia to build a 30-27 lead. Mackiewicz came up with a key win over Dmitriy Danilenko at 5-1 in the seventh and Dershwitz bested 2013 Senior World Champion Veniamin Reshetnikov, 5-2, in the eighth. Homer anchored against 2017 Senior World bronze medalist Kamil Ibragimov in the final bout and secured the 45-36 win to lock a position in the medal rounds for the Americans. In a rematch of the 2017 Senior World semis, Team USA fenced Korea – the reigning Senior World Team Champions. Despite winning or tying four of the nine bouts, the U.S. squad fell to Korea, 45-33. Korea would go on to take gold and retain the World No. 1 ranking. The Americans fenced a Hungarian team led by Szilagyi for bronze. Hungary won or tied seven of the nine bouts to earn take bronze, 45-34. For complete results, visit http://www.federscherma.it/cdm-luxardo2018.html.